Rahul Gandhi yesterday visited Amethi for campaigning for the general elections. 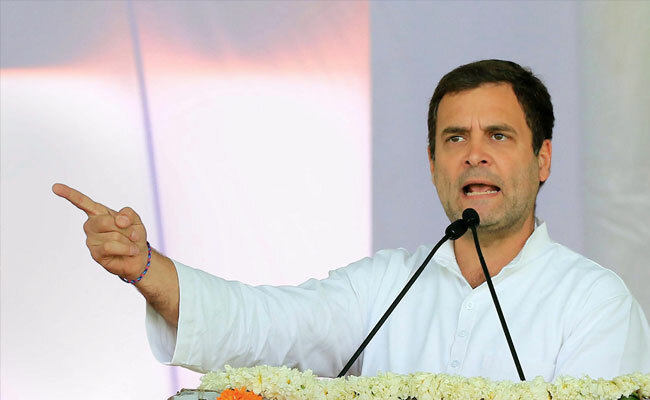 Farmers staged a protest and raised slogans against Congress president Rahul Gandhi in his parliamentary constituency Amethi in Uttar Pradesh. One of the protesters, Sanjay Sing told ANI: "We are very upset with Rahul Gandhi. He should go back to Italy. He does not deserve to be here. Rahul has grabbed our land." According to the records, UP State Industrial Development Corporation (UPSIDC) had leased 65.57 acres of land to the company in 1986 but when the company was closed down, the Debts Recovery Tribunal got it auctioned in 2014 at Rs. 20.10 crore to recover the loan. The land purchased in the auction was paid by the Rajiv Gandhi Charitable Trust for stamp duty of Rs. 1,50,000. The Congress scion has, however, always pitched for farmers' welfare and even promised to waive their loan in his election speeches.